Over the past seventy years, World Vision has grown from a small missionary agency to the largest Christian humanitarian organization in the world, with 40,000 employees, offices in nearly one hundred countries, and an annual budget of over $2 billion. While founder Bob Pierce was an evangelist with street smarts, the most recent World Vision U.S. presidents move with ease between megachurches, the boardrooms of Fortune 500 companies, and the corridors of Capitol Hill. Though the organization has remained decidedly Christian, it has earned the reputation as an elite international nongovernmental organization managed efficiently by professional experts fluent in the language of both marketing and development. 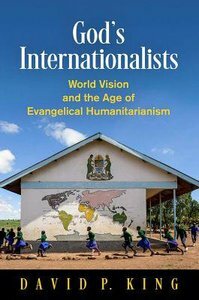 God's Internationalists is the first comprehensive study of World Vision-or any such religious humanitarian agency. In chronicling the organization's transformation from 1950 to the present, David P. King approaches World Vision as a lens through which to explore shifts within post-World War II American evangelicalism as well as the complexities of faith-based humanitarianism. Chronicling the evolution of World Vision's practices, theology, rhetoric, and organizational structure, King demonstrates how the organization rearticulated and retained its Christian identity even as it expanded beyond a narrow American evangelical subculture. King's pairing of American evangelicals' interactions abroad with their own evolving identity at home reframes the traditional narrative of modern American evangelicalism while also providing the historical context for the current explosion of evangelical interest in global social engagement. By examining these patterns of change, God's Internationalists offers a distinctive angle on the history of religious humanitarianism. About "God's Internationalists: World Vision and the Age of Evangelical Humanitarianism"
Senior Lecturer, University of Stirling. Chapter 8. A Changing World Vision: A Changing Evangelicalism?